This will be a discussion of research starting at age one and ending with issues related to dying, EMDR can be effective across a wide spectrum of human problems. We will examine how EMDR is used with traumatized children, in phantom limb pain, after motor vehicle accidents and other discrete traumatic experiences, in dissociative clients, and with pain issues, using data from scientific studies, videotaped demonstrations and case histories. We not only have brain pre-and post- neuroimaging studies of EMDR treatment, but also have been able to demonstrate neurobiological shifts during the session itself, making EMDR a form of treatment with neurobiological shifts within a single session, as well as over time; not only with PTSD, but also in phantom limb pain. Summarize the biological nature of trauma and how trauma can create physical and psychological symptoms to better understand your clients. Explain how EMDR is used for processing traumatic memories as it relates to clinical practice. 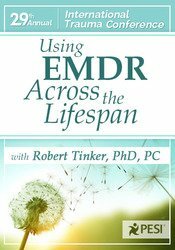 Evaluate research of the effectiveness of EMDR with clients aging across the lifespan. Examine the research that suggestions EMDR as a successful tool for the clinical treatment of phantom limb pain and as well as other pain. Describe how EMDR has been used to treat clients after motor vehicle accidents and other discrete traumatic experiences, in dissociative clients. Review the studies that show EMDR as a form of treatment with neurobiological shifts within a single session, as well as over time; not only with PTSD, but also in phantom limb pain. Summarize the results of neuroimaging studies that show the brain pre-and post EMDR treatment. Robert Tinker, PhD, PC, has specialized in EMDR for 26 years in areas of writing, research, consultation, training and clinical practice. He is the author of Through the Eyes of a Child: EMDR with Children.